The Dalai Lama was invited to Ireland in mid-April 2011 by three charities, Children in Crossfire of which he is patron, Spunout.ie and Afri. The visit to Kildare arose because of the close connection that exists between Afri and the Brigidine Sisters, who have been instrumental in having Kildare, the site of St.Brigid’s monastery, recognized as one of Ireland’s most important monastic sites. 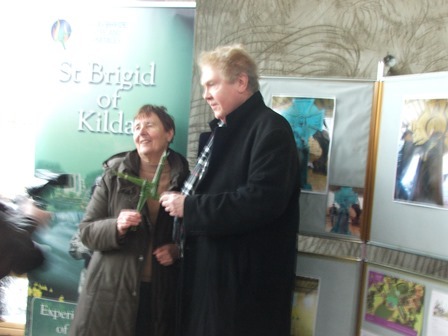 He arrived in the Market Square in Kildare town where he was welcomed with music and song. 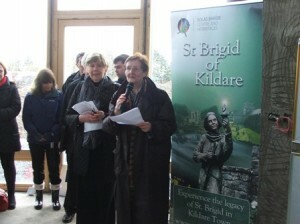 Gifts were presented by the Brigidine Sisters and some local children. The Dalai Lama was presented with the Brigid Flame by Srs. Mary Minehan and Phil O’Shea, Solas Bhride Community, in recognition of his work for peace and his life long commitment to non-violence. 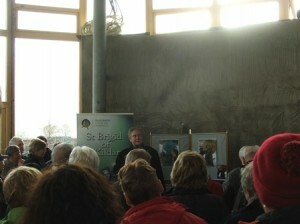 His Holiness then travelled by car to St. Brigid’s Church where he addressed those assembled on the theme of Compassion. Kildare bid farewell to the Dalai Lama and wished him well on his pilgrim journey with a Celtic blessing sung by harpist Fionnuala Gill. Fr. 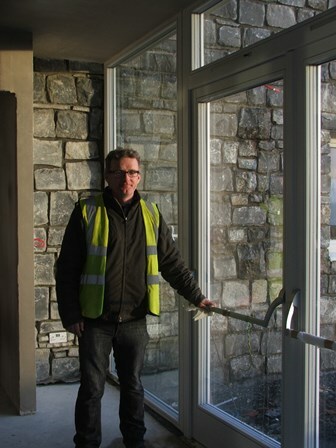 Tom O’Connor, St. Patrick’s Missionary Society reflects on his experience of meeting and praying with the Dalai Lama in St. Brigid’s Cathedral. “For me it was a moment I will treasure for the rest of my life. We waited with great expectation for nearly an hour as our distinguished visitor eventually made his way to this ancient place of worship. He looked resplendent in his saffron and maroon robes. Each of us was introduced to him by Sr. Eileen Deegan, CSB. I was a little nervous as I waited my turn. “It is a great privilege to meet you, Your Holiness. Welcome to Kildare.” He gently and lovingly took my hand and smiled. Then he bowed and said, “Thank you. I immediately had the sense of being in the presence of someone very special with a presence and energy that reached out in love, humility, respect and compassion. 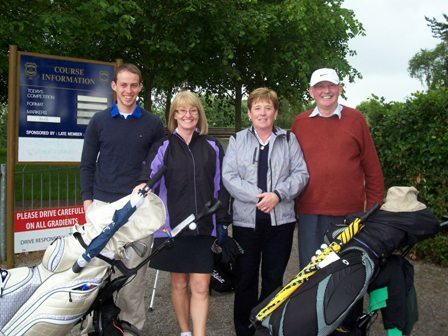 The winning team being presented with their prize by Sr. Mary Minehan and Willie Redmond, Golf, Classic Coordinator. A bright sunny morning, a torrential downpour in the early afternoon and a calm, humid evening was the experience of the participants in the Solas Bhride Golf Classic.The weather did not dampen the goodwill and great sporting spirit that prevailed throughout the event. 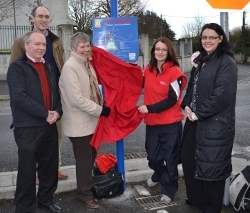 The first prize, sponsored by Newbridge Silverware, was won by Fitzpatrick’s Garage Ltd, Kildare town, team. 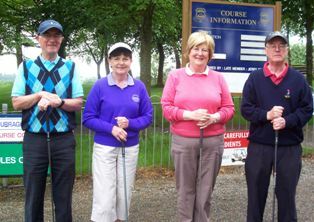 In 2nd place was Kildare Chilling Company team, whose prize was sponsored by Kelleher Clothing Company and The Heritage Golf Club. Kildare Chilling company team proudly display their prize! The Dunlea’s Garage, Kilcullen Team were the winners of the All Ladies Team prize, compliments of Whelan’s Pharmacy, Kildare town. 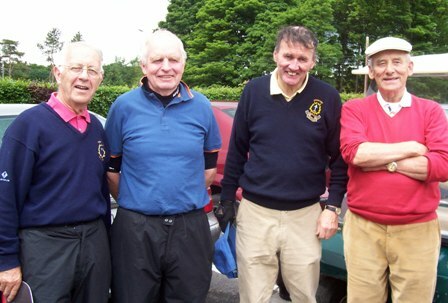 Solas Bhride and Organising Committee greatly appreciate the support of Team Sponsors, Tee Sponsors and Prize Sponsors. Special thanks to the Curragh Club for their warm welcome and facilitation of the event and especially Joe Connelly who looked after administration on the day. Eamonn Mulhall and team winners of 4th Prize. Teams enjoying a day out at Golf clasic!